The Wanganui Racecourse was packed out on Friday, but not with spectators or race horses. Instead, there were hundreds of wide-eyed students thinking about their futures. It was the Whanganui Senior Careers Expo and there was plenty on show, from army demonstrations to hairstyling, there was something for everyone. One of the first scenes on arrival saw a student sat in a harness which was attached to a large tree near the car park. 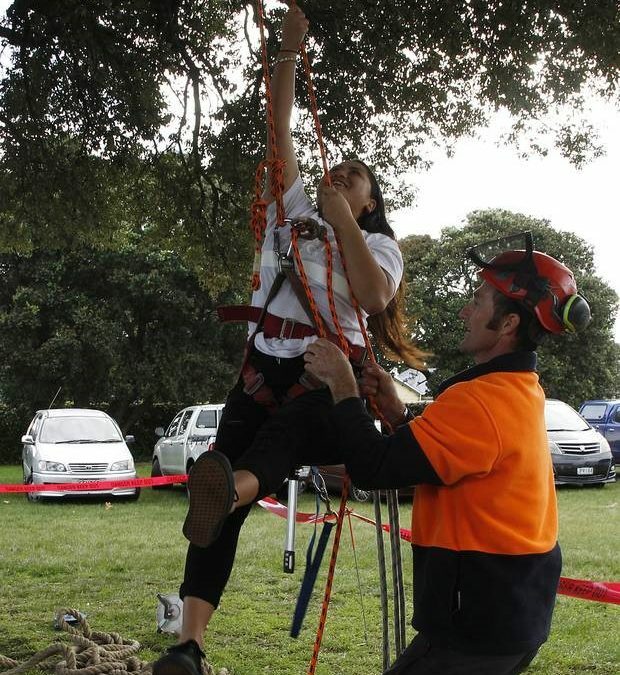 Destiny Reuben was experiencing what it felt like to pull herself up a tree, a task that an arborist would carry out regularly.”It was fun, when I first started I just thought I got to climb a tree so I gave it a try,” she said. Reuben is currently studying at the trade and commerce training centre on Guyton St in Whanganui. She had half an hour to look around the expo. “It’s not long, but we’ve got a whole bunch of assessments that we’ve got to do today,” Reuben said. Reuben was not certain of her career path, but would be looking into as much as possible. “I have only just got here and stopped because I saw all of this equipment, I don’t know if I’ll try any more experiences like this though – I can’t lift myself,” she said. Dom Steenstra is just happy that one more person is aware of what arboriculture is. Steenstra is a training adviser for Primary ITO and is overseeing the work being carried out on the day. “My job is to support trainees and apprentices who are employed and get them through their qualifications,” Steenstra said. An arborist is someone that studies trees and how to take care of them, their tasks can include pruning, felling, transplanting and maintaining the health of trees and shrubs. “Every storm we have there are trees blowing over and because of that shortfall there are huge opportunities at the moment, that’s why we’re here,” Steenstra said. Arborist Craig Blinkhorne from Rivercity Tree Services was on hand to secure anyone interested into the harness and give them instructions on what to do. “This tree hasn’t been looked after, which gives us an opportunity while we’re here to do some pruning and that’s why there are branches coming down,” Steenstra said.